Listen, you don’t have to sell me on the merits of adorning my finely-tailored shirts with shrunken heads skewered by tiny rods. I mean who hasn’t read the Wikipedia entry on “List of medical, psychological, and metaphysical benefits of customizing clothing with miniature noggins.” Right? Right? Whatever. Artist Ian on Etsy knows what I’m saying. 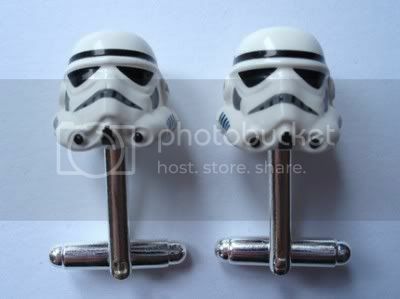 He stuck some LEGO Stormtrooper helmets on silver-plated cufflink backs because he recognized that you never know when the urge will strike to make like an Ewok and beat a drumbeat with a decapitated Imperial soldier. Why fight the urge? Check out Ian’s listing on Etsy to more pics and the LEGO gift boxes he built to accompany purchases. Prices start at $19.99. I love those! I liked the R2 ones he has also. However, I’d actually buy Yoda ones (as a gift for someone I know), if he could make those that’d be fabulous!